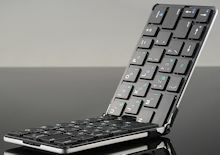 The Flyshark folding keyboard folds down the middle (between the "H" and "J" keys) into a pocket-sized package, compacting to around 5.1 x 3 x 0.5 in. and 5.5 oz. The design has just four rows of letter keys, in the standard keyboard layout, with full-size, low-profile keys. The original FlyShark folding keyboard was funded for $61,000 on Kickstarter in September 2014. A new updated FlyShark 2 keyboard then was funded for $40,000 on Kickstarter in October 2015. The new FlyShark iLepo 2 (aka iLepo 365) is lighter, has a one-year battery life, and enhanced Bluetooth Smart technology. It's designed thin but strong with aircraft-grade aluminum. The keyboard provides two dedicated function keys to access the number keys and other special characters and functions. The FlyShark iLepo 2 is available in multiple colors, for around $40 to $70. It works with smartphones, tablets, laptops, and computers. DJI has announced the Phantom 4, the next generation of its integrated drones for high-level aerial photography and cinematography, available soon for $1399. The new TapFly mode flies automatically in a direction that you tap on the app screen with clean and smooth motion. The ActiveTrack mode automatically tracks a moving subject from a safe distance, again simply by tapping to select the subject on the app screen. Plus, the Phantom 4 is redesigned for longer flight time (to 28 minutes) and faster speed (up to 44 mph). The Phantom 4 is available now for pre-order from DJI and, interestingly, from Apple. Shipping starts March 15, with product exclusively available in Apple Stores through the end of March. Meanwhile, the base previous-generation Phantom 3 Standard for beginner pilots is now only $499, and the Phantom 3 Advanced and Professional are $799 and $999 respectively, with high-def and 4K video, vision positioning (without GPS), and extended ranges. Entries posted to Manifest Tech Blog in March 2016, listed from oldest to newest.